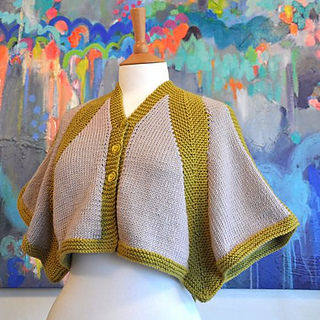 The Bessie May Shruginno Shades Shrug is inspired by art deco structure, bringing symmetry together to create a flowing shrug cardigan, that hangs straight at the front, with deep flows ending in a point at the center of the back hem. With two tone colour structure, the Shruginno is stunning from all angles. 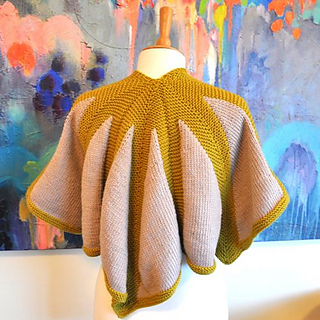 Knitted in five mitred identical diamond pieces, cleverly shaped by symmetrical decrease. Combination of stocking stitch and garter stitch panels. Two tone colour way, requiring an average of five colour changes per row, so not for the faint hearted.